New research by astronomers at the Harvard-Smithsonian Center for Astrophysics shows that planets still can form in this cosmic maelstrom. 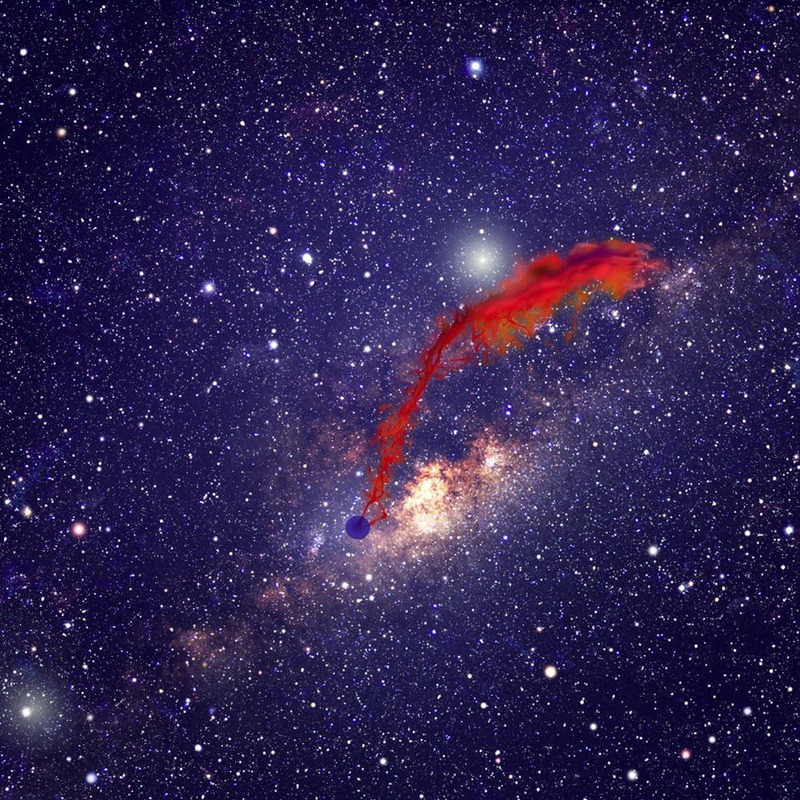 For proof, they point to the recent discovery of a cloud of hydrogen and helium plunging toward the galactic center. They argue that this cloud represents the shredded remains of a planet-forming disk orbiting an unseen star. "This unfortunate star got tossed toward the central black hole. Now it's on the ride of its life, and while it will survive the encounter, its protoplanetary disk won't be so lucky," said lead author Ruth Murray-Clay of the CfA. The results are appearing in the journal Nature. The cloud in question was discovered last year by a team of astronomers using the Very Large Telescope in Chile. They speculated that it formed when gas streaming from two nearby stars collided, like windblown sand gathering into a dune. Murray-Clay and co-author Avi Loeb propose a different explanation. Newborn stars retain a surrounding disk of gas and dust for millions of years. If one such star dived toward our galaxy's central black hole, radiation and gravitational tides would rip apart its disk in a matter of years. They also identify the likely source of the stray star – a ring of stars known to orbit the galactic center at a distance of about one-tenth of a light-year. Astronomers have detected dozens of young, bright O-type stars in this ring, which suggests that hundreds of fainter Sun-like stars also exist there. Interactions between the stars could fling one inward along with its accompanying disk. Although this protoplanetary disk is being destroyed, the stars that remain in the ring can hold onto their disks. Therefore, they may form planets despite their hostile surroundings. As the star continues its plunge over the next year, more and more of the disk's outer material will be torn away, leaving only a dense core. The stripped gas will swirl down into the maw of the black hole. Friction will heat it to high enough temperatures that it will glow in X-rays. "It's fascinating to think about planets forming so close to a black hole," said Loeb. "If our civilization inhabited such a planet, we could have tested Einstein's theory of gravity much better, and we could have harvested clean energy from throwing our waste into the black hole."